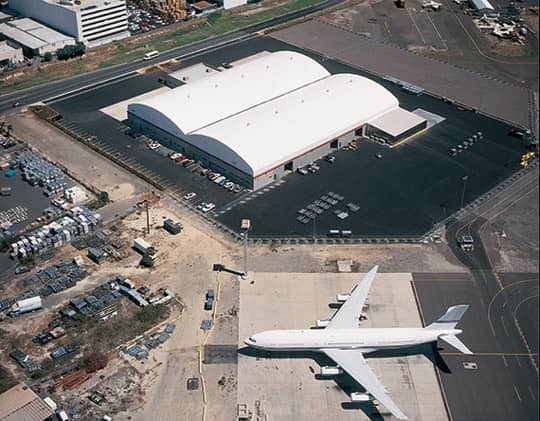 A unique twin-link fabric structure, fabricated with durable Shelter-Rite® architectural fabric, capably and cost-effectively met United Airlines need for a durable cargo storage facility that could be constructed very quickly. Kynar is a 1 mil fluoropolymer top finish and contains a minimum of 70 percent polyvinylidene fluoride (PVDF). This high content is the key difference compared to standard PVDF coatings, which typically contain less than 30 percent. Kynar also contains carbon-fluorine (C-F) bonds, one of the strongest and most stable chemical bonds that exist. The alternating C-F bond results in a higher polarity on the surface allowing it to resist environmental degradation, chemicals and dirt accumulation. The very low surface energy and low coefficient of friction of the Kynar coatings resist soiling as compared to standard PVDF finishes. The lack of dirt accumulation and the non-nutrient value of Kynar to support fungal growth further inhibit mildew development. In laboratory tests on coated fabric, Kynar performs comparably to Tedlar top finish film.